Animator and alumnus of The Joe Kubert School. Located in New Jersey. Able to create all types of cartoon art-character designs, storyboards, comics, traditional animation, Flash, graphic design, illustration, and color design. 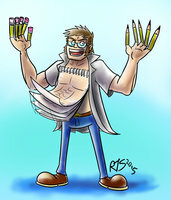 Proficient in Photoshop, Clip Studio Paint, Flash, and Toon Boom Studio.